On a humid afternoon last summer, I met with Jay Rayner in order to interview the esteemed restaurant critic over lunch. Jay chose for us to meet at Dumplings Legend on Gerrard Street, the beating heart of London’s China Town, and alongside talking about his new book and stage show, we spoke in quite some depth about Jay’s love of Chinese food – dim sum in particular. I, too, have always been fond of dim sum, but since eating at Dumplings Legend I’ve become obsessed with siu long bao – a type of Shanghainese ‘soup dumpling’. Parcels of thin glutinous dough are shaped like Pac-Man ghosts and filled with balls of minced meat (traditionally pork) encased with rich stock that makes a dreadful mess if the whole dumpling isn’t devoured whole. Siu long bao are the true embodiment of the term dim sum, meaning “touch the heart”. Alas, although deliriously tasty, soup dumplings require tremendous skill to prepare and are still fairly difficult to find in London. 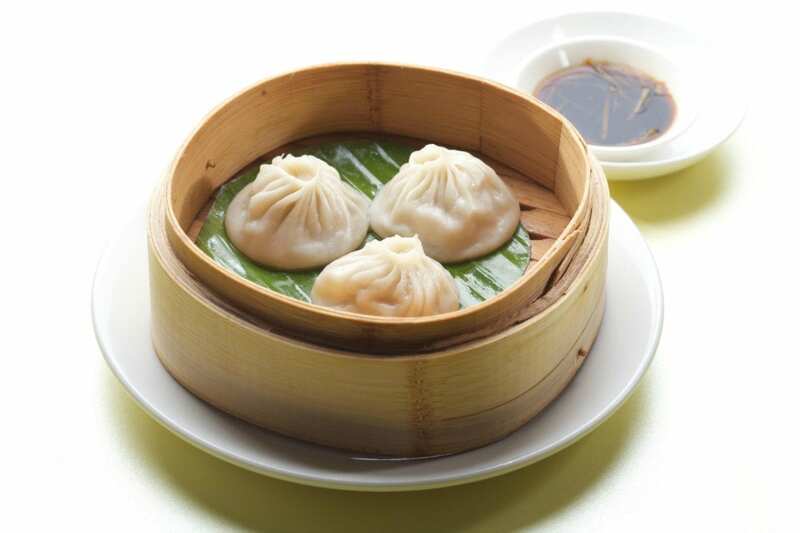 One particular restaurant that’s become renowned for its sui long bao, nonetheless, is Shikumen – a mini-chain with three restaurants spattered about the city in frankly odd locations. Joining a venue in Ealing and one in Shepherds Bush, the latest branch of Shikumen is inside the O2 Centre on Finchley Road, sandwiched between Pizza Express and a Vue cinema. 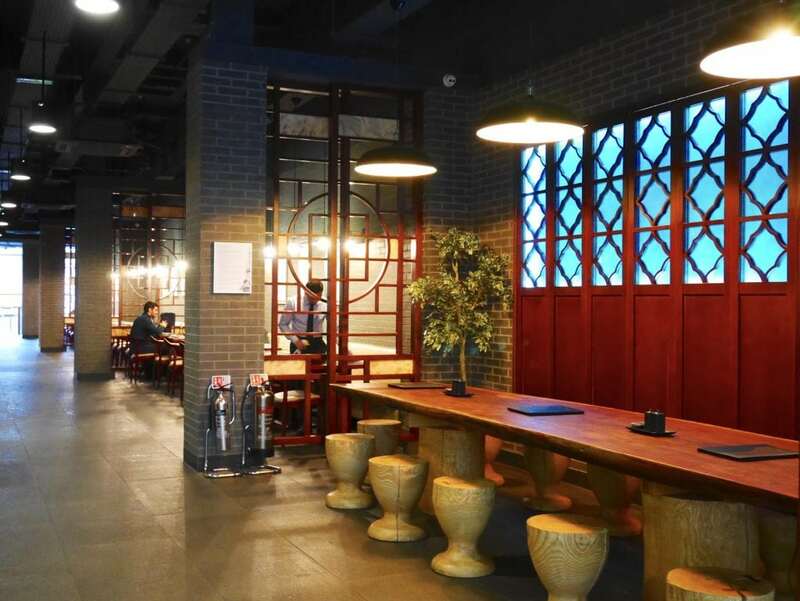 Named after a type of Shanghainese architectural style, literally translated as ‘Stone Warehouse Gate’, the inside of the Finchley Road restaurant is so industrial it resembles the dungeon of a Han dynasty castle. What’s more, on a Friday afternoon, we’re the only customers, bar one sullen couple that stare into their phone screens for the whole lunch, without exchanging one word no matter how unpleasant. Fortunately, the food here is mostly very good. We begin with two puff pastry parcels of sweet, slightly spiced venison. The venison is cooked slowly and melts on the tongue, while the pastry is topped with sesame seeds and glazed so heavily it resembles a dessert. Conversely, these ‘puffs’ are a remarkable start to lunch. Next, a dim-sum platter contains four pairs of steamed dumplings. Classic prawn har gau has thin sticky dough on the brink of bursting, filled with so much prawn abetted by fragrant ginger. More prawns come with Chinese chive and prawn dumpling and crabmeat and prawn dumpling, both of which are fine but unmemorable. The pumpkin seafood dumpling is far more exciting. Sweetness of prawn and crab are joined by earthy notes of pumpkin, though it’s the culmination of texture that’s most pleasing on the tongue. Better still are siu long bao (so good that we order two portions) with their paper-thin dough, neatly pleated and filled with ludicrously decadent pork broth and a ball of pork meat studded with plenty of refreshing ginger to cut through the intense fat. These are amongst the best example of this intricate dish on available in London at the moment. No matter how horrid they may sound, chicken feet with chilli and black bean sauce are considerably similar to chicken wings on most occasions. In this particular instance, however, the claws are cooked through, but they’re not cooked slowly enough for the tough meat to break down and become palatable. What’s more, the bean curd sauce is so tooth achingly sweet that it knocks the harmony of each ingredient completely off course. A larger dish of eel on rice is exactly that. A piece of eel the thickness of a hosepipe is lovingly grilled to the point of having a crisp, charred skin that’s deftly sweetened, contrasting the luscious soft meat lying beneath. Also on the plate, a mound of rice has been steamed to an ideal level of stickiness, though tender stem broccoli is grilled, bitter and unwelcome. We forgo dessert and finish with a pot of jasmine tea that flowers before us, served in a glass teapot, and leave an hour after entering. In the respect of enjoying a very quick lunch, Shikumen is ideal. Although the food here is somewhat expensive and by no means the best Chinese in London, the dim sum is some of the best on offer, especially in this part of town. Shikumen Finchley Road can be found at Unit 7a, First Floor, O2 Centre, Finchley Road, London, NW3 6LU. Previous PostAre Brits actually starting to cook?